I’m going to walk way out on a limb and assume you want to grow—financially, professionally, and personally. Okay, it wasn’t much of a limb. More like lounging in a lawn chair while looking at the tree. Regardless, the gifts discussed below apply to any endeavor. From building your firm to concocting tastier dinners. Most quadrant charts encourage you to migrate from “bad” boxes to the best box. But in this case there’s a crazy Danger Zone lurking in the middle. The excerpt below from a recent proposal I submitted illustrates the peril. The Danger Zone is when you think you know what to do, but you actually don’t or, worse, your limited knowledge is pointing you in the wrong direction. The other component of the Danger Zone is when you think you can do something well (or well enough) but you actually can’t (or shouldn’t). ** For example, most consultants should not squander precious time on bookkeeping, routine analysis, or posting social media. What you need are the two gifts that will eject you from the Danger Zone: Perspective and Reliable Information. Sounds easy and obvious. So why don’t we, as consultants, have perspective and reliable information? It’s difficult to gain perspective when you’re constantly ping-ponging between delivering projects and scrambling for new business. Where in that mad dash for projects or delivery is stepping back to build long-term growth? Reliable information is scarce when data is non-existent. If you don’t track anything, you won’t know where you are. Since most consulting companies track little beyond their revenue it’s no surprise there’s a paucity of reliable information. Information is of little value unless you have benchmarks or experience. Let’s say 50% of prospects you reach out to call you back to learn more. Is that good? Without benchmarks, you’re living in the Danger Zone. Fortunately, obtaining the gifts of Perspective and Reliable Information is pretty simple: enlist outside viewpoints, track your results and access benchmarks. For instance, mastermind groups are a useful source of perspective, as are experts, advisers and mentors. The right adviser(s) will also be able to tell you what to track and will have benchmark data. 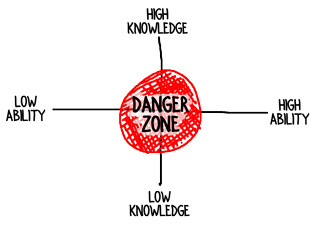 Are you inhabiting the Danger Zone on your business? Probably. The most insidious aspect of this condition is that we rarely realize we’re in it. We think we’re lounging in the lawn chair when we’re actually teetering on a high limb. The danger zone is insidious and not having a good grasp on income projections or project amounts makes planning (and living comfortably) next to impossible. I wish I had more certainty and confidence in my ability to improve things. Karen, thanks for being willing to share this. You’ve brought up an interesting take on this. Usually folks in the Danger Zone are oblivious and living in ignorant bliss. What you’ve pointed out, though, is that living in the Danger Zone increases uncertainty and that, in turn is darn stressful. Consulting tends to be an unpredictable business and that’s especially true for solo consultants like you. What I’ve seen is that when a consultant KNOWS her offering hits a urgent, pervasive, expensive market need, then confidence surges. After that it’s merely a question of executing on good client acquisition process. If you’re struggling, go back to your offering and make sure it’s strong. Well, as the CFO of an accounting company I can definitely say that we track a LOT beyond our revenue, and we make great use of that data. But I’m not sure where I haven’t been soliciting perspective. Marketing, sales, HR, vision, operations, finance, customer service – we’re working hard on those areas but I have no doubt we are missing some things that experts in those areas would identify. We’ve been soliciting perspective, but we could always solicit more perspective. We started a post-project QA process recently and I had another such conversation yesterday – got AMAZING feedback, plus trends are starting to emerge regarding what our clients adore the most when working with us. We’ll be tracking Pipedrive stats as soon as we use it more consistently in real-time. * I created a client-by-client earnings summary report for one of our employees. She was asking some questions recently and I thought she’d like to know how much she has earned for each engagement on which she has been deployed. I hadn’t thought of mid-project QA. I wonder what to ask. Hm! OH MY GOSH this set of worksheets & checklists is AWWWWWWESOME! I recognize a lot of these from the book. Here they are larger and interactive. And I found the checklist you mentioned. THANK YOU!!! Glad you like the worksheets, Jaime! 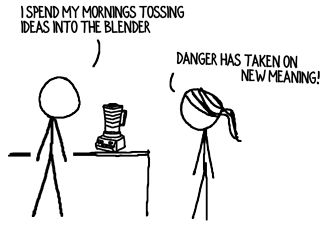 Yes, they are drawn from The Executive’s Guide to Consultants, but are in a much more usable form. Let me know which worksheets and checklists work best for you and how you are adapt them for your practice. Oops, that’s “startled” in the first bullet point.